We’d love your help. Let us know what’s wrong with this preview of Other People's Worlds by William Trevor. Här får man lite inblick av hur lätt det är att lura en godtrogen människa som känner sig ensam. Men var går gränsen egentligen mellan godhet och godtrogenhet. Alla vill ju bli sedda. Och kanske är det så att även de som blir sol-och-vårade anser att tiden de blev uppvaktade var värt att bli bedragna. To ask other readers questions about Other People's Worlds, please sign up. Love this book and books like Good behaviour Molly Keane which are a bit dark any recommendations? I hadn't quite thought of it this way. Yes, we're connected; we abut; we do dialogue; we do the essentials in conjunction: procreation, tennis volleys, sarcasm. Yet, in real life, we are not actors in a stage play; this is not a set piece. Each of us has, first, our own existence, our own understanding, our own world. Yours is not mine; nor mine, yours. But by necessity, we occasionally enter each other's world. And there is not always a suitable translation. Julia Ferndale is widowed, a Catholic I hadn't quite thought of it this way. Yes, we're connected; we abut; we do dialogue; we do the essentials in conjunction: procreation, tennis volleys, sarcasm. Yet, in real life, we are not actors in a stage play; this is not a set piece. Each of us has, first, our own existence, our own understanding, our own world. Yours is not mine; nor mine, yours. But by necessity, we occasionally enter each other's world. And there is not always a suitable translation. Julia Ferndale is widowed, a Catholic, with two grown daughters and living with her mother in slightly reduced circumstances. She types legal documents for the law offices of Warboys, Smith and Toogood, Solicitors and Commissioners of Oaths. Doris Smith lives with her daughter, a love child, and hides her half-bottles of vodka in a bread box. She sells shoes, but not after her petty thievery is discovered. Francis Tyte looks like Leslie Howard and has done commercials, small parts in television. He ingratiates, charms. He leaves when he has what he wants. It is Francis who fathered Doris' child. It is Francis who will marry, then desert Julia. Connections suddenly were everywhere, an ugly sense crept out of hiding. This is classic Trevor, with an attention to detail (sponge-bag trousers and a jacket gone over with thawpit), wry colloquialism (He'd got even thinner, his face especially, not that it didn't suit him. Lean bacon's best, as Irene in handbags always said. ), and a seeping creepiness. Without giving too much away, the big twist at the end was so vaguely alluded to that I had to double back, thinking I must have missed something. William Trevor seems to be a bit of a master at subtley disturbing tales of small-town England, and I especially loved the early 80's period detail (drinking Tizer and watching Streets of San Francisco) and the slow build up of tension. A sad novel at heart, and kind of reflective of the nihilism of that particular time in the UK. He's great, is Trev. If while stuck in a crowded airport, sitting on a subway train or waiting for a table at a popular restaurant, you’ve mused about or even concocted lives for some of the people around you, then you’ll enjoy William Trevor’s books. The author has an uncanny ability to capture the despair of individuals trapped within circumstances – particularly when those circumstances are of their own making. Trevor’s “studies” of these personal psychological dilemmas are enlightening, depressing, always engagi If while stuck in a crowded airport, sitting on a subway train or waiting for a table at a popular restaurant, you’ve mused about or even concocted lives for some of the people around you, then you’ll enjoy William Trevor’s books. The author has an uncanny ability to capture the despair of individuals trapped within circumstances – particularly when those circumstances are of their own making. Trevor’s “studies” of these personal psychological dilemmas are enlightening, depressing, always engaging, and are laced with subtle and dark humor. The author effectively slips the reader into his characters’ lives as a true fly on the wall, chronicling the human condition, without being heavy-handed, overwrought or judgmental. This novel is less than 250 pages and it’s difficult to imagine another author telling this story as poignantly in a book twice the length. In Other People’s Worlds, 47 year old widow Julia Ferndale has fallen in love with and is set to marry 33 year old Francis Tyte. Francis is a bit-player actor, his face recognizable from television tobacco commercials, who has a very tawdry past. In a word he is a true scoundrel, with a trail of human wreckage, the result of his self-centered manipulative opportunism. This review has been hidden because it contains spoilers. To view it, click here. So much prose writing style by today's authors --even the literary lights we admire -- is crass, hard edged, often blunt and profane. I'm ok with this since so much else in the works of our genius writers is praise worthy -- themes, structure, complex portrayals of the human condition. But, it's fitting in remembering the incomparable William Trevor to savor his marvelous prose, so rich, subtle and evocative. 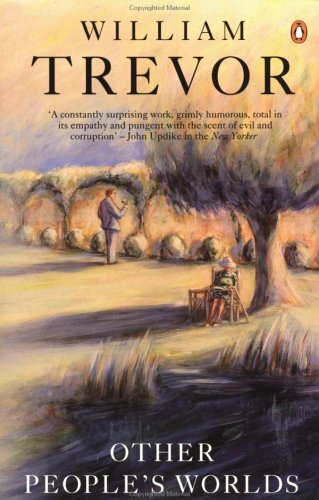 In describing a character in just two sentences Trevor can give us a deeply nuanced sen So much prose writing style by today's authors --even the literary lights we admire -- is crass, hard edged, often blunt and profane. I'm ok with this since so much else in the works of our genius writers is praise worthy -- themes, structure, complex portrayals of the human condition. But, it's fitting in remembering the incomparable William Trevor to savor his marvelous prose, so rich, subtle and evocative. In describing a character in just two sentences Trevor can give us a deeply nuanced sense of the character's essence and relationship to time, place and others. His writing is amazing in how it distills so much depth of meaning in so economical a fashion. Perhaps it's his ability to so effortlessly convey such depth that made him the master of the short story genre. In his works, including his novels, Trevor often first introduces us to people that are recognizable and situations that are comprehensible, but then inserts a character who will dramatically alter the predictable paths of the lives of these people. In "Other People's Worlds", Julia Ferndale is a 47 year-old widow living with her mother in comfortable circumstances. Julia views other people a bit too incautiously; she has a compassionate outlook that her hard-edged mother thinks could stand a bit more skepticism. Julia has fallen in love with a much younger man, Francis Tyte, and they are set to be married in a few weeks. Francis is a journeyman actor, a handsome, charming man who is principally known for his appearance in a television commercial. Francis has a smooth and ingratiating personality and he's captured the affection of Julia's entire family. Francis is an utter fraud, a sociopath who has manipulated and defrauded women and couples across the country. Everything he has told Julia about his past is false, including the story that his parents were killed in a railway accident; they are alive in a retirement home. Francis is married to a much older women who he has abandoned. In London he had taken up with Doris, a shop girl, with whom he's had Joy, a hapless girl now twelve years-old. Doris is obsessed with her "Frankie" who stops by from time-to-time but keeps from making their relationship permanent with lies about his "dying" wife who he cannot abandon. It is suggested that Francis was sexually abused as a child, but this could be a lie. We do learn that on late night jaunts into London's seamier district he performs sexual acts with men for money. Julia and Francis are married and depart on their honeymoon to Italy where on the first day Francis announces that he has no intention to remain with Julia and gets her in her shock to sign over some valuable jewelry he has had his eye on. Julia returns to England shattered, but doesn't wish to make this fraud public. Julia was a deeply religious Catholic, but in a counseling session with her priest we see that this event has shattered her belief that God is merciful and just. There is a newspaper account of Francis's cruel act (the hotel manager had notified the Italian police) and thus learning about Julia Doris seeks her out. Doris is becoming increasingly unbalanced and has developed a delusion that an actress seen with Francis has stolen him from her. Doris's drinking is out of control and she is making threatening statements toward the actress. Julia tries to intervene by going to London to stop Doris who is on a drinking binge and can't be found. Julia becomes aware of Joy's plight and there's a growing indication that she must do something to save this child. Doris's threats to the actress are not fulfilled, but it is learned from the newspaper that a woman matching Francis's wife has been murdered. Doris is shown to be locked away somewhere, either prison or an asylum. Totally immersive reading; brilliant characterisation; dark; funny; touching. I thoroughly enjoyed this novel. One of Trevor's creepy tales with a wicked bit part actor reeking havoc on innocent people's lives. William Trevor's most admired novel is , but is its equal. The title alerts us to the author's modus operandi - we are being placed inside the consciousness of several disparate characters, each of which is impervious to the real truth. The major viewpoint belongs to Francis Tyte, an actor who is impelled to live out a fantasy life, using others - usually women - as his material. The novel gives us as convincing a portrayal of a psychopath as does with Mr Hilditch. Francis is a consummate actor a William Trevor's most admired novel is , but is its equal. The title alerts us to the author's modus operandi - we are being placed inside the consciousness of several disparate characters, each of which is impervious to the real truth. The major viewpoint belongs to Francis Tyte, an actor who is impelled to live out a fantasy life, using others - usually women - as his material. The novel gives us as convincing a portrayal of a psychopath as does with Mr Hilditch. Francis is a consummate actor and master seducer, gentle, sensitive and considerate, able to cry real tears,yet never able to relate to or love those naive women who become his victims. As with FJ we have an innocent woman as the central prey to this predator. The third Trevor book I've tackled is quite different from the others which were set in Ireland in the early years of the twentieth century. Other People's Worlds is set in and around London in the late 1980s and addresses the psychology of the people who have the misfortune to befriend the self-absorbed Francis Tyte. Ruth Rendell writes this sort of book much better, or at least she did in her heyday. They always say things like, "how quiet he was" or "he'd be the last person you'd imagine". Francis Tyte is another of Trevor's quiet, unassuming psychopaths, and appropriately (chronologically) somewhere between Septimus Tuam (in The Love Department) and Mr. Hilditch (in Felicia's Journey). Thrilling and chilling. That Trevor can reach such a fever-pitch of terror with his calm, lulling prose is in itself a work of art. William Trevor, KBE grew up in various provincial towns and attended a number of schools, graduating from Trinity College, in Dublin, with a degree in history. He first exercised his artistry as a sculptor, working as a teacher in Northern Ireland and then emigrated to England in search of work when the school went bankrupt. He could have returned to Ireland once he became a successful writer, he William Trevor, KBE grew up in various provincial towns and attended a number of schools, graduating from Trinity College, in Dublin, with a degree in history. He first exercised his artistry as a sculptor, working as a teacher in Northern Ireland and then emigrated to England in search of work when the school went bankrupt. He could have returned to Ireland once he became a successful writer, he said, "but by then I had become a wanderer, and one way and another, I just stayed in England ... I hated leaving Ireland. I was very bitter at the time. But, had it not happened, I think I might never have written at all." In 1958 Trevor published his first novel, A Standard of Behaviour, to little critical success. Two years later, he abandoned sculpting completely, feeling his work had become too abstract, and found a job writing copy for a London advertising agency. 'This was absurd,' he said. 'They would give me four lines or so to write and four or five days to write it in. It was so boring. But they had given me this typewriter to work on, so I just started writing stories. I sometimes think all the people who were missing in my sculpture gushed out into the stories.' He published several short stories, then his second and third novels, which both won the Hawthornden Prize (established in 1919 by Alice Warrender and named after William Drummond of Hawthornden, the Hawthornden Prize is one of the UK's oldest literary awards). A number of other prizes followed, and Trevor began working full-time as a writer in 1965.